There is a certain fluidity to all that Lamar Jackson does, a presence on display through all evaluations. For all of Lamar Jackson's remarkable abilities, his mindset and make-up should not go without mention. There is no debating what Louisville's Lamar Jackson has been; unequivocally, he finishes his iconic career as one of the game's best of all-time. What is up for discussion is Jackson's potential as a franchise quarterback; while not projected to be one of the top selections in the upcoming NFL Draft, he is expected to be a relatively-high pick. Though Jackson, like any prospect, should be up for full-scale evaluation, how he has handled such scrutiny, oftentimes unfair, is worth covering. For all of Jackson's remarkable abilities, his mindset and make-up should not go without mention. At times, this pre-draft season, it has felt like Jackson has been held to a slightly-different standard. While his unprecedented dual-threat production does come with questions as it pertains to transitioning to the next level, Jackson has faced a constant barrage of questions and suggestions as to who he is and all that he could be. He, through it all, has remained focused, steadfast and true, staying above the fray as others have gone below the belt. The numbers, as well-documented, are beyond compare. In addition to countless awards and honors, Jackson became the first FBS player to pass for at least 3,500 yards and rush for at least 1,500 yards in a single season, a feat he accomplished twice. Jackson is the first non-senior to reach 9,000 career passing yards and 4,000 career rushing yards. Despite going pro early, he set or shared 42 Louisville records and seven ACC marks. Along with Colin Kaepernick and Tim Tebow, he is one of three players with 50 passing and rushing scores. Jim Johnson believes Jackson is the best college football player ever. In summary, Jackson compiled the most total yards of any power five junior of all-time, recently passing the 2015 number two overall pick in the NFL Draft in Marcus Mariota. His only true historical frame of reference is himself, a seemingly-growing shadow that somehow became an unfair and unrelenting barometer. Jackson was so good that we no longer compared him to others, only to his personal best. Some of that paradox has carried over into this spring. As a playmaker, Jackson has had to fight the idea of mutually-exclusivity, the fact that he is both a great passer and runner at the same time. Seeing hasn't necessarily been enough to make everyone believe; Jackson has had to sell it, too. Though he arguably shouldn't have had to, Jackson has mixed preparation with public relations in the lead-up to the NFL Draft, continuing to show critics that he can make every throw. Jackson, going above and beyond, has done his job, bringing even more validation to his potential as a prospect. Here's the thing about Jackson: yes, he rushed for 3,172 yards and 39 touchdowns in his two full years as starter, but he also threw for 7,203 yards and 57 scores. This past fall, Jackson's passer rating was 146.64; for point of reference, Sam Darnold's was 148.09, Josh Rosen's was 146.97 and Josh Allen's was 127.79. Of the aforementioned four quarterbacks, Jackson's 3:1 touchdown-to-interception ratio was by far the best of the group; better than Darnold at 2.59:1, Rosen at 2.4:1 and Allen at 2.09:1. What is ironic is that athleticism is considered a great asset for signal callers, if not a prerequisite, unless, apparently, you are too athletic. The idea of dynamic mobility being a negative trait for a quarterback prospect feels tired, outdated and wrong. In this specific case, it is, at the very least, overplayed. The NFL's passer rating leader, Alex Smith, rushed for nearly 1,100 yards and 15 touchdowns in two collegiate seasons, while rising star Deshaun Watson ran for nearly 2,000 yards and 26 scores and 2016 rookie of the Year Dak Prescott rushed for more than 2,500 yards and 41 touchdowns. Two faces of football, Cam Newton and Russell Wilson, ran for 1,473 yards and 20 scores in one year and 1,421 career yards and 23 scores, respectively. Kaepernick had three-straight 1,000-yard efforts and 59 TDs. Andrew Luck almost reached 1,000 career yards. Obviously, Kaepernick, Newton and Wilson have all taken teams to Super Bowls. Another dual-threat talent, Blake Bortles just about did. Quite frankly, the game appears to be changing in some ways. Four pro quarterbacks rushed for over 400 yards in the regular season a year ago compared to zero a decade prior. Recently, Newton led Carolina to Super Bowl 50, rushing for 636 yards and ten touchdowns in an MVP season. Wilson ran for a combined 1,388 yards in pacing Seattle to consecutive big game appearances, winning Super Bowl XLVIII. Kaepernick scrambled for 62 yards and a touchdown in Super Bowl XLVII. There are a number of examples of versatile talents elevating the status quo of their organizations. Play-calling that both utilizes an athlete's running ability, but also simply implies the mere threat of it, is becoming more mainstream in today's playbook. Jackson, mind you, played in the offense of a former NFL head coach. That approach comes with advantages that keep defenses off-balance. While the possibility of wear and tear is always very real, both mobile and non-mobile quarterbacks have missed significant amounts of time due to contact and non-contact injuries. Just say you want to completely ignore a special versatility that made Jackson, the past two years, a more productive runner than Penn State' Saquon Barkley in terms of total yards, yards per carry and scores. Jackson, the passer alone, had a higher yard-per-attempt average than Rosen and Allen and roughly the same figure as Darnold; that measure has proven to be a great indicator of future success as each of the national leaders from 2009-2014 have played in the NFL, including Mariota, Newton, Tyrod Taylor and Jameis Winston. Furthermore, and this is using passing statistics only, over the last ten years in the ACC just three quarterbacks have thrown for at least 3,500 yards, with a minimum of 30 touchdown passes and ten or fewer interceptions: Mitchell Trubisky, Winston and Jackson. Trubisky was selected second overall in the 2017 NFL Draft, while Winston was the number one pick in 2015. We are waiting, with far less of a consensus, to see where Jackson is picked. The only three players in college football since 2000 to register at least a 145 quarterback rating with 30 passing touchdowns and 1,000 yards rushing in a single season are Newton, Watson and Jackson; Newton, as mentioned, is a former MVP, while Watson looks like he could be one soon. If that company is connotative, Jackson is primed for big things. Criticism, pertaining to Jackson, hasn't always been consistent. Narratives that are obvious and understood have, at times, appeared to be more Jackson-specific. Talk of how he must go to the right team, how the proper scheme will have to be tinkered to his strengths and how he may not be ready to play right away aren't indictments of Jackson as much as they are realities that have been true for almost every single quarterback in the history of scouting. Jackson isn't the first player to come with some possible qualifiers, simply the next one. Smooth on the field and off, Jackson hasn't stumbled on his sprint to the NFL. He has been a model of consistency, instead. Jackson, the youngest Heisman Trophy winner ever, has shown a maturity beyond his years for years. For all of Jackson's highlight-reel plays, his calming presence also helped his teams win. As executives consider who the next face of their franchise will be, the person that Jackson is, in addition to the player, has to be appealing. Leadership has long been a Jackson staple. Throughout his college career, one where attention and hype were unwavering, Jackson was eager to deflect to praise and quick to accept blame. He, despite his youth, emerged as gracious and genuine on the national stage. After a late fumble from Florida State's James Blackman gave Jackson an extra possession and a game-winning score, he made it a point to encourage the freshman post-game. Impressively, Jackson stayed grounded as his popularity reached even-new heights. Jackson expressed the following in a heartfelt Heisman Trophy speech: "...to my teammates, this award is for all of you. I can't wait to cherish this moment with all of you, and I love you guys. But to be included...I love Dede, man. I love Baker. I just met these guys, and I love them. Deshaun and Jabrill." After committing to play in Louisville's bowl game because he felt he owed it to his teammates, Jackson explained of his three interceptions, "...that is on me, nobody else," adding of his role on the roster, "...ain't nobody special. We're the same." Start to finish with Louisville, Jackson was more than just first-team, he was team-first. That attitude of accountability, one where the most prominent player is willing to do whatever it takes to win, can be a very real foundation for stability and success. Jackson has proved that he will be out in front for his football team, and not just because he is the fastest player on the field. Forget the measurables or statistics, Jackson's perspective is the prototype. "As I have said before, Lamar is the best player you're ever going to see," Louisville head football coach Bobby Petrino stated after Jackson's decision to enter the NFL Draft. "His impact on our university and this community has been immeasurable. And while personal accomplishments have been massive, he has remained such a humble person and has been a terrific teammate who cares more about others and simply winning." How Jackson has responded to endless questions about his flaws, volatile professional projections and even suggestions of a position change speak to just how prepared he is for the pressure-cooker of the NFL. Week-in and week-out at Louisville, Jackson was the complete focus of opposing defenses, with staffs working tirelessly to get him out of his comfort zone and rhythm; the last few months haven't been all that different. In believing in himself and his future as a franchise quarterback, Jackson has displayed a powerful conviction in interviews. 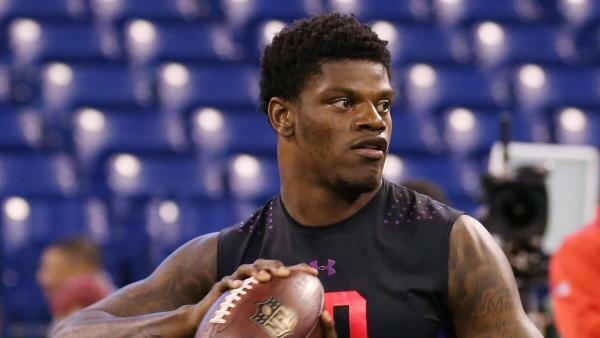 In choosing only to throw at the NFL Combine and Louisville's pro day, he made a shrewd decision to showcase his skills as a quarterback through the prism of a pure passer, choosing not to make his speed and quickness a focus. Jackson has done his part to control a sometimes-uncontrollable narrative. He has made statements with his words and actions alike. It's an old adage that everyone in the NFL is talented. Oftentimes, it's the intangibles that make all the difference. By acing a pre-draft process that has been downright unfair in some respects, Jackson may be, by proxy, accelerating his own transition. Still just a young 21 years of age, Jackson is proving he is ready for the moment. Given his poise in pressers, poise in the pocket may come as a reprieve. A very real part of the Jackson draft package is the who, not just the what, when, where and why. He has earned and is earning the opportunity to lead an NFL team. Whatever chance Jackson gets, he will make the most of. The destination won't disrupt the dream. No quarterback, ever, not even the 6'4'' signal callers with whatever the right amount of athleticism is, has been a sure thing or can't miss. There is no perfect prospect, an annual lesson we simply refuse to accept. As last season's collection of quarterbacks in the AFC and NFC Championship Games showed us, whatever rules have been used to evaluate talent is, quite often, wrong. Ultimately, Jackson may help flip the script. Jackson comes with questions, too. What we see in most players, however, is potential; with Jackson, it seems, that upside has us up-tight. His skill set does come with some variety and maybe it's easier to rely on past traditions then embrace new ones. Innovation can come with hesitation. Perhaps Jackson is another pigskin pioneer. How Jackson has, and how he hasn't, responded to the rhetoric prior to the draft may be indicative of how he will perform after it. Jackson has taken the best of his competitors, the worst of outside opinions and maintained his same silky stride. There is a certain fluidity to all that Jackson does, a presence on display through all evaluations. To succeed at the next level, you have to be the best of all that you have been; already, Jackson is on the right track.